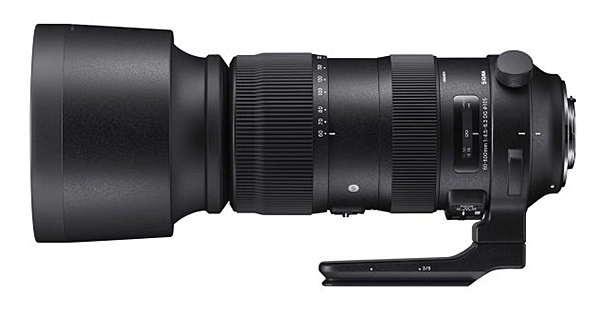 Sigma is covering all focal lengths, from wide-angle to super-duper-telephoto, with its latest announcements of five new Global Vision lenses. They are the 28mm f1.4 DG HSM Art, 40mm f1.4 DG HSM Art, 56mm f1.4 DC DN Contemporary, 70-200mm f2.8 DG OS HSM Sports, and 60-600mm f4.5-6.3 DG OS HSM Sports. 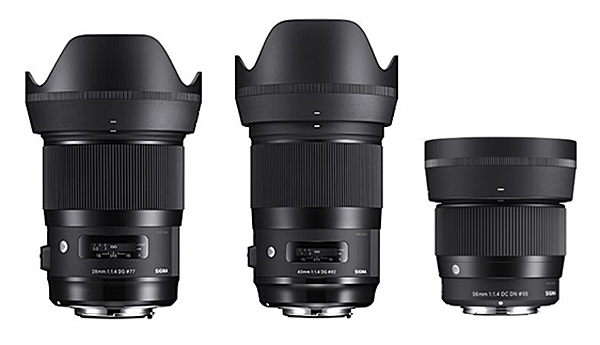 Sigma 28mm f/1.4 DG HSM and 40mm f/1.4 DG HSM Art lenses for DSLRs and the 56mm f/1.4 DC DN Contemporary lens for M4/3 and Sony E-mount. Source: PhotoReview/Sigma. Sigma is also reportedly developing a full-frame L-mount camera with a Foveon sensor. This is part of the L-Mount Alliance Sigma has forged with Panasonic and Leica. Sigma says all its future cameras will feature the L-Mount, marking an end of SA mount. However, the company is developing an SA-to-L mount adaptor. More interestingly, it’s also designing a Canon EF-to-L adaptor, which will enable Canon glass to connect with new full-frame mirrorless cameras by Sigma, Panasonic, and Leica. The Sigma wide-angle prime lens has an optical design to correct magnification chromatic aberration and sagittal coma flare, as well as minimising distortion. There are 17 elements in 12 groups, including three aspherical elements, three SLD glass elements and two elements made from FLD glass. It features a Hyper Sonic Motor and updated algorithm to enable high-speed autofocus, water and oil-repellent coating on the front lens element, and a dust/splash proof structure. It’s available in Canon EF, Nikon F, Sony E and Sigma SA mount. The 40mm f1.4 DG HSM Art is Sigma’s first lens developed to acquire the sought-after angle of view and performance standard of a benchmark cine lens. This lens has 16 elements in 12 groups, including three FLD (‘F’ Low Dispersion) elements and three SLD (Special Low Dispersion) elements to correct axial chromatic aberration and magnification chromatic aberration. It is available for Canon EF, Nikon F, Sony E and Sigma SA mount. This completes Sigma’s large aperture series of portable wide-angle, standard, and telephoto prime lenses in MFT and Sony E mounts. The compact, lightweight lens has 10 elements in six groups, a nine-bladed rounded diaphragm and accepts 55mm filters. The minimum focusing distance provides a maximum magnification of 1:7.4. Available in Sony E and MFT mounts. 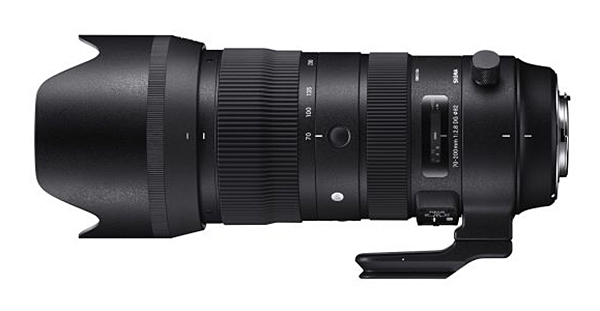 Sigma rates the 70-200mm f2.8 one of it’s most anticipated lenses. It’s the new flagship large-aperture telephoto zoom to meet the needs of professional photographers. A magnesium body is robust, yet lightweight (well, 1805 grams) and dust/splash proof along with oil and water repellent coating on the front element. Optical design includes 24 elements in 22 groups, including 10 exclusive low-dispersion glass elements which allows for high-res shooting from the centre to the corners. It has an 11-blade rounded iris diaphragm. Available in Canon EF, Nikon F, and Sigma SA mounts. This is the world’s first 10x optical zoom telephoto lens with a tele end of 600mm. Incorporating 25 elements in 19 groups, consistent image quality can be achieved throughout the entire zoom range. This lens’ features the latest algorithm to deliver an image stabilisation effect of four stops. The optical design ensures correction of magnification chromatic aberration encountered in hyper-telephoto shooting. This offers both high res and edge-to-edge performance throughout the entire zoom range. The lens will be available in Sony, Nikon, Canon, and Sigma mounts, shipping in late October with American pricing at US$1999.